The Selina Rose Gallery is safely with my sister and she appears to be very happy with it. Below is a photo my husband sent to me via his phone shortly after he arrived at my sister's place (late evening). She is busy unpacking the house and contents and has found the perfect corner for it in her home. (I'll probably get in trouble with my Sis for posting this photo!) I love you Karen. That is one thing ticked off my to-do list. I have to admit I think I suffered a mini burn-out after rushing to get the Gallery finished in time. I didn't even want to go into my craft room for a number of days. However this weekend, after a bit of a tidy up, I have managed to tick another thing off my to-do list (well almost). Yesterday I re-papered my vintage triple gable Amersham with reproduction Amersham papers. I got the papers from Trevor Cain of Dolls House Restoration (dollshouseman on e-bay). I couldn't uncover enough of the original papers safely because a previous owner had used sticky contact papers over them throughout the house and had taped some lighting wires over the original papers with sellotape. However I have left the remains under the reproduction papers. The original papers in the house were all different coloured tulip papers. I have used a mix of reproduction Amersham papers (possibly from different eras) but I couldn't resist the cute lamb paper in one of the bedrooms and I chose not to have a tulip paper in the kitchen opting instead for a blue circle design. The exterior appears to have also been overpainted and there are signs that the roof was originally green. Today I reverted back to childhood and just had a play. A while ago I won an auction lot of vintage Barton and Dol-toi furniture and I had fun setting out my rooms and finding some little accessories to give the house a life. I still need to find some bathroom items. My tiny cook decided he would like to take up residence with his collie dogs. It is a perfect bachelor pad for him. The house and furniture is 1/16th scale. To give an idea of scale the two wardrobes (the tallest pieces of furniture) are only about 10cm tall (4 inches) as is the cook. It is hard to guess the age of the house. Amersham houses were available between about 1930 to 1957. My initial guess was that this house is from the late 1940s/early 1950s. However, there are also many things that indicate the house could be from an earlier period. Trying to date the house is made more difficult by changes made to the house by previous owners. Clearly I need to do more research. The house when I purchased it in May 2013. Bedroom 2. The nursery paper may not be ideal in a bachelor pad but isn't the vintage lamb paper cute. A closer picture of the little cook laying out his culinary masterpieces on the table. The resident collie family. Some lovely vintage bone china dogs picked up at an op shop. Anyway, there is still a bit of weekend left so I might do a paper minis book kit to go on my bookshelf project. Then I'll be one step closer to ticking off another item on my to-do list. Just to finish off I just want to thank everyone for all their well-wishes and good luck wishes with regard to my husband losing his job and seeking new employment. They are really appreciated by all of us. No good news yet but we will keep you posted. Veronique, for many recent comments you have had your fingers crossed for my husband. Your thoughtfulness is so appreciated but I am concerned your fingers may remain forever crossed if you don't relax them now and then! Thank you my friend. Your sister looks so happy with her precious gift! I like your new project. The accessories, TV and radio, show, more or less, the date of the the house. You'll have your hands full of fun work. By the way, I love the dogs. Your sister's smile is priceless! 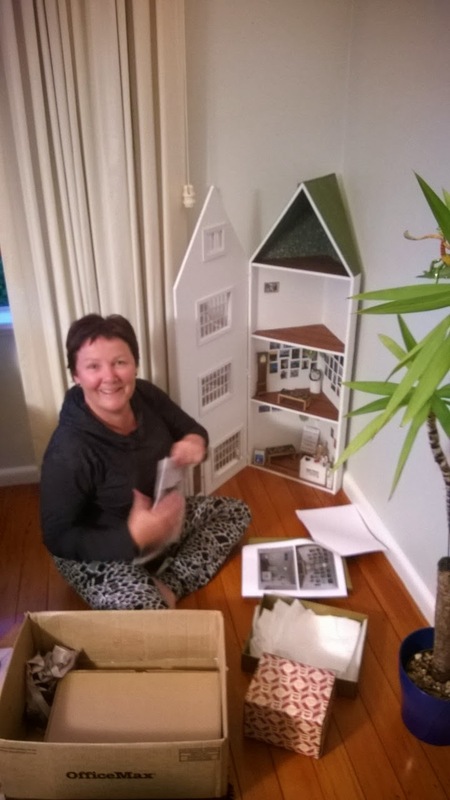 I love your dollhouse project. Lots of things to tick off the list, but it sounds like you are making great progress. Enjoy the rest of the weekend! I don't know enough about Amersham houses to be able to date it - it would be great to know more! Glad your sister likes her wonderful present! How did your husband's interview go? Even a bachelor has to have a spare bedroom, even if it has lamb wallpaper! Haven't heard anything back following the interview Rebecca so we are not expecting good news. Hopefully something is around the corner. Your sis is a lucky gal! This new project looks to be a lot of time, take it slow and bounce between it so not to get burnt out, I get that myself. Best of luck to the hubby in the hunt! Su hermana se la ve muy feliz con el regalo, nunca había visto una casa de esquina, muy original. Menudo cambio le has dado a la casa! está preciosa con todos los detalles. Tu hermana se ve tan simpática como tú. Mucha suerte para tu marido y un gran abrazo. Your new project looks like a lot of fun. Lovely items you have for it. Your sister looks very happy with her house lucky lady. Your sister looks very happy with her special gift. I like your new project. Enjoy! Sharee, the smile of your sister is priceless after she has received your gift :D! Take good care of yourself, Sharee! Your sister looks very happy with her lovely gift and it fits so well in that corner! That is one interesting little house you are working on. Looking forward to the unfolding of the project! The smile on your sisters face says it all, and your little amersham house is lovely! Hi Sharee! What a picture of happiness on the face of your sister Karen! What a great and treasured gift you have made for her and you must feel so proud too! Es una idea fantástica preparar una casa de esquinera. So nice to know that the gallery arrived nice and safe and that your sister is so happy with it! Love your new/old project :-) You and your husband continue to be in my thoughts. cara Sharee, tua sorella mi sembra molto contenta del bellissimo regalo che le hai fatto. e adesso auguri per la realizzazione del tuo nuovo progetto!